The Istanbul Chamber of Industry’s (ICI) ordinary assembly for July was held in Odakule on July 26, 2017 with the main agenda of “Impacts of Global Climate Change on Our Industry with Regard to Production, Sustainability, Efficiency and Competitiveness”. The assembly, moderated by ICI Vice President of Assembly Hasan Büyükdede, hosted Prof. Mikdat Kadıoğlu, a faculty member at Istanbul Technical University. During his speech on the assembly agenda, Erdal Bahçıvan, ICI Chairman, said: “Unless we take relevant measures, we might run out of water, a required input for our industrial production,” highlighting that the drought and climate change-driven changes in rainfall patterns threaten water resources, one of the main industrial inputs. “The government, industrialists, and all relevant parties should take necessary measures. Domestic and renewable energy should be promoted, rather than opting for energy import, which is the main reason for high current deficit. Moreover, our industry should engage in a less energy-intensive production. The Internet of Things, artificial intelligence and big data technologies will enable a more efficient use of energy,” indicated Bahçıvan. Following his address, Hasan Büyükdede, ICI Vice President of Assembly, invited Erdal Bahçıvan, ICI Chairman, to the floor for him to share his views on the agenda. Bahçıvan started his speech by noting that global climate change causes warming of the earth, changes in rainfall patterns, decline in biodiversity, and depletion of natural resources. Bahçıvan remarked that disastrous sudden and heavy downpours, just as the one witnessed in Istanbul last Tuesday, has an adverse impact on daily life. Indicating that the Global Risks Report 2016 published by World Economic Forum, an agenda item of previous assemblies, reports climate change as one of the top threats in comparison with the past findings, Bahçıvan stated that climate change-driven water crises, food shortage, limited economic growth, migrations, and increased security risks have a negative impact on the economy. Adding that natural destruction threatens, on the other hand, the sustainable use of energy and raw material resources, the two key inputs for the industry, Bahçıvan emphasized that cost of production inputs, first and foremost energy, are on the rise while resources are in decline. As an example for the threats against the industry, Bahçıvan pointed out that the drought and changes in rainfall patterns caused by the climate change resulted in a reduction of water resources, one of the most important industrial inputs, and unless any measures are taken, we might run out of water to be used in the industrial production. Bahçıvan stressed that unless we take solid measures against climate change risks, the resulting impacts will unfairly fall on future generations, adding that while meeting today’s needs, resources should be used without decreasing those of the next generations. Bahçıvan also noted that adopting a sustainability-oriented vision for our business and lifestyle in consideration of the next generations is more critical than ever. Bahçıvan underlined that achieving a sustainable lifestyle would definitely call for an overall makeover in the mindset. Noting that the society will not be able to continue producing and consuming as it does today, Bahçıvan said that there is an imperative need to transition to sustainable, ecofriendly, efficient and competitive production. Noting that European countries take similar measures as well, Bahçıvan informed that the U.K. plans to gradually transition to clean resources for electricity generation by 2025. Emphasizing the importance of remaining sensible about climate change, Bahçıvan added that they should however not ignore the criticisms brought to the international climate agreement. Indicating that the criticisms center around economic imbalances, Bahçıvan informed that more than half of global greenhouse gas emissions can be traced to just 25 companies, and only 100 companies are responsible for 71 per cent of the gas emissions. Therefore, Bahçıvan underlined that it would be unfair to put equal responsibility on all countries regarding the climate change. Noting that after all the destruction caused, it would be unjust of developed countries to hold back only developing countries under the pretext of climate change, Bahçıvan reminded the importance of tackling the issue of climate change in a fair environment that protects the competitive power of Turkey and other countries. Noting that Turkey has a relatively high current deficit, which is basically driven by energy import, Bahçıvan said that domestic and renewable energy should be promoted in consideration of the fact that only one fourth of the energy supply comes from domestic production. Bahçıvan also noted that the industry should perform less energy-intensive production, underlining the importance of domestic and national resources. “Technological developments offer new opportunities in this regard: In the upcoming years, the Internet of Things, artificial intelligence and big data technologies—results of the digital transition that will drive a radical transformation in the manufacturing industry—will certainly enable more efficient use of energy. Briefly, science and technology are key to achieving resource and energy efficiency in our industry. Our industry should increase its efficiency and competitiveness by turning environmental threats into opportunities through suitable technologies and clean production practices. This understanding should be applied for the entire production process. I am proud to share that the Istanbul Chamber of Industry, the founder of the first branch in Turkey whose name includes the word “environment”, has the adequate knowledge and experience on environment and climate. We, as a chamber of this mindset, have always defended an environment-friendly and nature-focused production approach, and will continue to do so. Taking the floor after Mr. Bahçıvan, Prof. Mikdat Kadıoğlu said that the average temperature of the earth drops and rises by 1 degree every 150 thousand years. Noting that the earth has warmed 1 degree over the last 150 years alone, Kadıoğlu said that the blame is on humans. Indicating that one of the most serious problems is dry winters, Kadıoğlu stated that half of the rain falls during the winter and the impacts of winter rainfall decline would be felt throughout the year. Kadıoğlu noted that the global temperature would go up by 2 degrees due to climate change, which means 15 times rise in extreme values. Explaining that climate change will cause critical sociopolitical developments, Kadıoğlu said that both the Kyoto Protocol and the Paris agreement are most defended by the European Union, which is driven by the concern of potential waves of migration from the South Africa. Kadıoğlu also indicated that snowfall has declined by 15 percent, another problem resulting from the warming. Highlighting that snow water is accumulated as reserves in certain areas, helping the protection of the flora and feeding into the groundwater gradually, Kadıoğlu stated that the dam and groundwater in the East Anatolia are not fed enough due to the decline in snowfall. Informing that the number of floods, droughts, hails and lightnings have tripled since the 1960s, Kadıoğlu noted that Istanbul is also threatened by a potential earthquake, which will cause 30 percent loss of the GSYH according to a scenario. Indicating that disaster management is misinterpreted in Turkey, Kadıoğlu underlined that it actually means anticipating the risk and minimizing it to a manageable level. Underlining the importance of virtual water which is used for the management of water, Kadıoğlu remarked that in Turkey, 80 percent of water is consumed in agriculture, and especially in cotton production, dam and ground water is used instead of rain water. Kadıoğlu described groundwater as a strategically relevant type of water, which therefore needs to be conserved and saved for difficult situations, yet Turkey uses it in cotton production. “We need to start planning today for our agriculture in light of the long-term climate change. We have three suggestions for conservation of water. The first one is rainwater harvesting. We used to do this through cisterns. Secondly, we can conserve water by building greenhouses in dry regions. 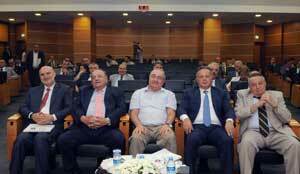 The last one is to reduce evaporation,” Kadıoğlu said. Following the speeches, ICI Assembly Members took turns to deliver their accounts of the global climate change. 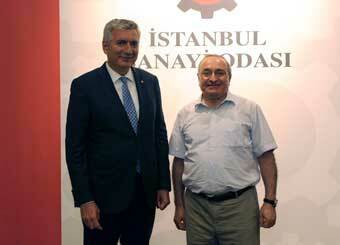 Additionally, Prof. Mikdat Kadıoğlu answered ICI Assembly members’ questions on the meeting agenda.